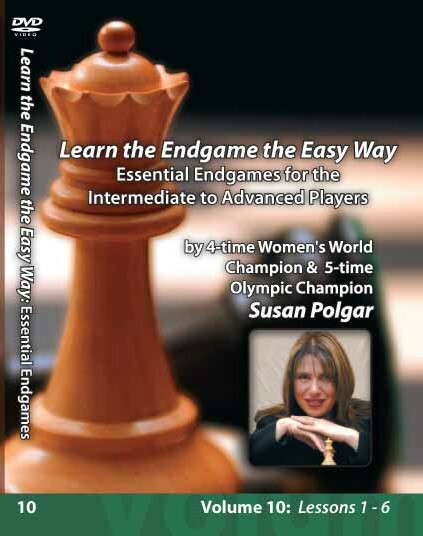 Essential Endgames for the Intermediate to Advanced Player Volume 10 Learn Endgames the Easy Way: Essential Endgames for the intermediate to advanced players.” 2 hours and 23 Minutes On this DVD, Susan will bring you to the next level on your way to mastering the Endgame. This is a great follow-up DVD to Volume 8 and 9 (Essential Basic Endgames Parts 1 and 2). On this DVD, Susan teaches you how to play and win the more difficult Pawn, Rook, Bishop, Knight, and Queen Endgames. By using frequently occurring Endgame examples, Susan will have you prepared to handle even the most challenging Endgames that can arise.